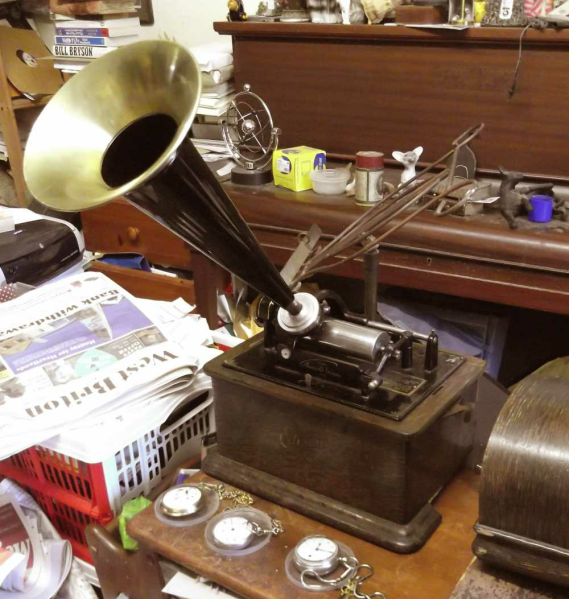 A hundred and twenty years ago – sixty-odd years before the tape-recorder became generally available – it was quite possible for ordinary people to make sound recordings in their homes without using any specialised equipment. What is more, this process did not involve any microphone, amplifier or other electrical device, nor did it need an external power source; it could be done in a gaslit drawing-room, a ploughman’s cottage or an explorer’s tent. The technology was that of the cylinder phonograph, as developed by Thomas Alva Edison from 1887 onwards. The record medium was a cylinder or tube 4.25” long and just under 2.2” wide (108mm x 55.8mm), made of a wax-like mineral compound. The hardware – the phonograph itself – was originally very bulky and heavy and required fragile wet-cell batteries (resembling thick-necked decanters full of liquid acid) to power its electric motor; however, by the late 1890s Edison was offering a model (the Standard) which was compact and portable – so much so that even in the 1930s ethnomusicologists and folk-song researchers were still using thirty-year-old phonographs, usually Edison Standards, to make field recordings. Edison had originally intended the phonograph as a dictating-machine rather than a means of entertainment, so that his machines (and often those of other manufacturers as well) were designed to allow easy recording in the home or office; all one had to do in the way of preparation was to release a thumbscrew or clamp, remove the ‘reproducer’ (sound-box or playing head), put a ‘recorder’ in its place, fit a horn or speaking-tube, and place a blank cylinder on the ‘mandrel’ (the nickel-plated barrel which carries the cylinder, thus corresponding to the turntable of a gramophone). There are still a few people today who do this. 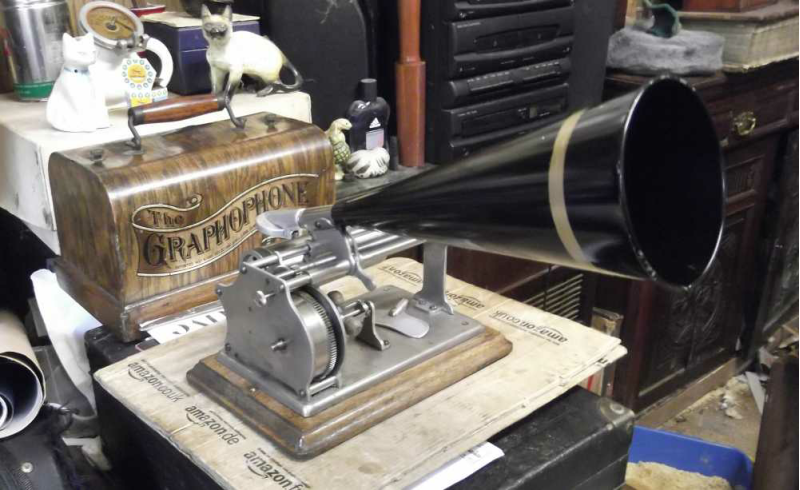 I am one of them, and the purpose of this page is to share a few details and examples of what the phonograph could do in its own time and what it can do today. I am not an expert, and perhaps that is precisely the point: being an Edwardian-style recording engineer is, to my mind, much simpler than being a present-day one, at least if one does not aspire to record a whole band or complex ensemble. dialogue-box which will then appear, click Open link or Open file. in the world (as far as I know) who still make them. the quality of Paul’s blanks in their virgin state. formed a studio orchestra, D’Almaine was appointed its leader. In later life he built a new career as a chiropractor. The ‘Scotch Air’ is Ye Banks and Braes. Gramophone & Typewriter discs. The recording speed is very slow for a cylinder, about 115 r.p.m. rather distant wailing of a cat, followed by a distinct bark of a dog. even older version than this, included among the samples which Gaisberg took to Philadelphia in March 1895.
design which is now almost universal; its distinctive buzzing quality is quite recognisable on this record. perhaps to modern listeners, follow traditions generally observed by bass singers in performing the song. I believe this is the first attempt since Edison ceased production in 1929 to record a classical orchestra on a cylinder. arranged it for strings and wind. The movement was too long for the cylinder. have been recognised as such. At least 24 sides were recorded, embodying perhaps about a third of the score. complete Faust issued by Pathé in 1911); Laute-Brun – plain Laute until 1907 – had just joined the same company. handful of winds and a trombone. At over four minutes, this is an exceptionally long-playing record for its size. study and practice of the sardana.